No. 110 -R ope stitch. 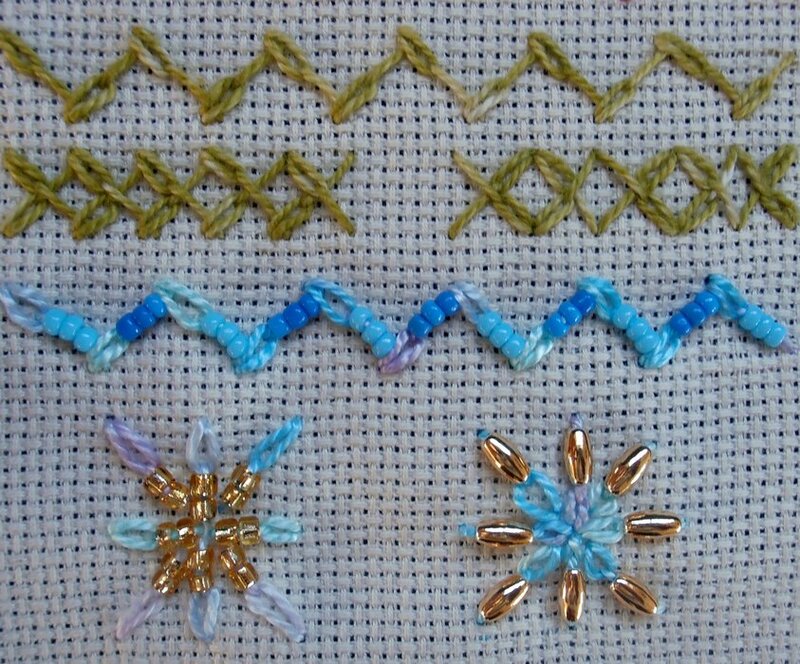 http://tiny.cc/or9ufx link to rope stitch in Flickr – 2 photos from an earlier TAST. No 112, Feathered Chain. Also an easy stitch to do and inspiring too. I crossed the long arm chains – 2nd row, left. and crossed the right side ones with tails together and heads together. I found I could either stitch down the line on one side, then the other or make a pair down the line. Either was no bother. No 113. Beaded Feathered Chain. The tapestry 26 needle comes into its own with perle thread and beads. I just Had to play with Sharon’s flower and will try it with finer thread and beads. This year Sharon intended taking it easy with Tast stitches but seems to be putting out 2, bi-weekly, which makes it easy for her Followers but must be hard on her with such a busy schedule of her own. Thanks Sharon for all you do for everyone. If anyone wishes to learn how to create stitches, they can go to the TAST Faqs here It is free to learn and available to New or experienced Stitchers. Beautiful TAST stitches! it is so inspiring to wait a bit and see what everyone else is doing before jumping in! Your Beaded flowers are awesome! You are very kind Queenie. Thank you. Love the double row of feathered chain stitch. Just had a closer look to see the difference between the right and the left row! Thanks for the visit Annet.